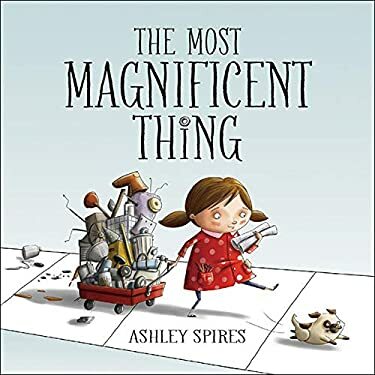 Award-winning author and illustrator Ashley Spires has created a charming picture book about an unnamed girl and her very best friend, who happens to be a dog. The girl has a wonderful idea. ?She is going to make the most MAGNIFICENT thing She knows just how it will look. She knows just how it will work. All she has to do is make it, and she makes things all the time. Easy-peasy ? But making her magnificent thing is anything but easy, and the girl tries and fails, repeatedly. Eventually, the girl gets really, really mad. She is so mad, in fact, that she quits. But after her dog convinces her to take a walk, she comes back to her project with renewed enthusiasm and manages to get it just right.For the early grades' exploration of character education, this funny book offers a perfect example of the rewards of perseverance and creativity. The girl's frustration and anger are vividly depicted in the detailed art, and the story offers good options for dealing honestly with these feelings, while at the same time reassuring children that it's okay to make mistakes. The clever use of verbs in groups of threes is both fun and functional, offering opportunities for wonderful vocabulary enrichment. The girl doesn't just ?make? her magnificent thing --- she ?tinkers and hammers and measures, ? she ?smoothes and wrenches and fiddles, ? she ?twists and tweaks and fastens.' These precise action words are likely to fire up the imaginations of youngsters eager to create their own inventions and is a great tie-in to learning about Science, Technology, Engineering and Math. New (324 available) BRAND NEW. Over 1.5 million happy customers. 100% money-back guarantee. Make your purchase count: support Better World Books' worldwide literacy partners.